Great looking Sidewall Register or use as White Ceiling Register. Choice of two styles with several size selections will help you find the sidewall register or white ceiling register you need. Let this be your solution for Round Sidewall Registers or Round Ceiling Registers. This register is easy to install, giving you the round sidewall register or round ceiling register you want. Toe Kick Registers are perfect for under cabinets and other baseboard areas. Find toe space registers with dampers to control airflow, or toe space returns that do not contain a damper. Try Rockwell air vents as wall register covers by using our wall clips. These decorative Rockwell air vents are a great choice for Arts and Crafts homes. By using them as wall register covers and floor registers you can get a complete look throughout your home. Choose from 6 finishes for your Rockwell air vents: Black, Oil Rubbed Bronze, Copper, Satin Nickel, Brass or Antique Brass. Contemporary vent covers can be converted into decorative wall registers in a snap. Depending on the size of the contemporary vent covers you will either use our wall clips, or the vent will come with pop out screw holes. The all metal, decorative wall registers come in 6 colors: Satin Nickel, Oil Rubbed Bronze, Black, Antique Brass, Brass and Copper. Our Victorian register covers can easily be turned into sidewall registers for a cohesive look throughout your home. The Victorian register covers either use wall clips or pre-made pop out screw holes for installation. Sidewall registers in decorative designs and finishes can be hard to find. Look no further, we have 6 finishes for you: Satin Nickel, Black, Antique Brass, Oil Rubbed Bronze, Copper and Brass. Take a look at our decorative wall registers made from solid aluminum. Dampers can be included to control air flow. Paint them or leave them natural. They can be used indoors or outdoors. Classic Grills offers their solid aluminum and solid bronze grilles with dampers for use as registers. You can use these registers on both the wall and ceiling. They are great for any decor and are sure to bring style to your space. Looking for a decorative vent that won't rust? These resin grilles are rust, crack, sweat, and corrosion resistant. These grilles offer the beauty of decorative vents without the hassle of traditional materials. You can also order a damper to turn these returns into registers. The dampers must be ordered at the same as the grille. Checkout 100's of options for wall registers. Fully adjustable dampers to control air flow. Decorative styles and finishes that you have been looking for. Spruce up your floors or walls and really make people take notice. 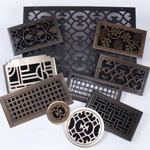 Hard-to-find decorative vent covers available in 5 round sizes. Each round wall vent comes with a damper to control airflow. Decorative styles and finishes that you have been looking for. 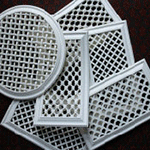 Spruce up your round wall or ceiling vent covers.